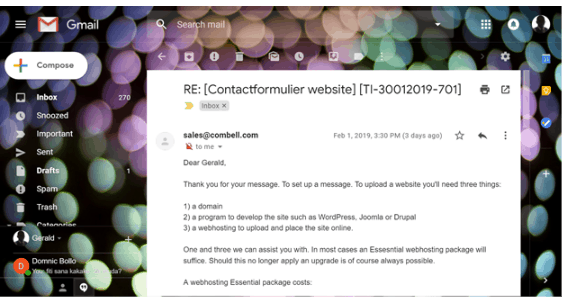 Combell Review 2019: Is Combell a Good Hosting? Belgium company Combell serves companies, software developers, and information technology integrators with a range of web hosting and other solutions. Combell was founded in the early days of the internet, in 1999, and is one of the market leaders in the provisioning of hosting services. It serves companies, software developers, and information technology integrators. Combell’s website can be switched between Dutch, French, and English.software and hardware. This vendor offers a collection of beginner-friendly hosting services. Its three web hosting plans are Linux-based and come with a 90-day money back guarantee, up to 250 GB SSD storage space, up to 100 x 500 MB MySQL databases, one-click installer, PHP support, and hosting for up to eight websites. The provided site builder requires no coding experience and comes with more than 140 unique templates and ready-to-use widgets. This, coupled with Combell’s own drag-and-drop control panel, will enable you to create and manage a fully functional mobile-ready website in just three steps. Combell offers a variety of CMS hosting services for WordPress, Magento, Joomla, and Drupal. It also offers managed hosting solutions that come with 24/7 monitoring, fast networks, proactive support, and advanced protection. Best of all, they can be tailored to your exact requirements. Combell’s plans are not the cheapest you will find, but they’re reasonably priced for the features, and they are often offered at promotional prices. You can pay by credit card, Bancontact, iDeal, or bank transfer. Although Combell advertises monthly prices, you can only purchase plans on annual terms. And although there are no free trials, the almost unheard of 90-day money-back guarantee gives you a full three months to decide if this really is the right host for you. Combell offers 24/7 telephone support, it responds to emails within twenty-four hours, and it also handles support issues via ticketing. I wasn’t impressed with the response time when I tested the ticket system since it took the sales team two days to get back to me. On the plus side, at least this was a real response rather than a robot. If you are a beginner webmaster, you will really benefit from Combell’s collection of video tutorials, and its knowledge base should tell you everything you need to know to get started. Put simply, Combell gives you the confidence of an amazing uptime guarantee, an industry-leading money-back guarantee, and a satisfactory SLA. Keep your website up-and-running with Combell’s uptime guarantee. Wondering how Combell stacks up against other Web Hosting companies? Enter any other Web Hosting company and we will give you a side-by-side comparison.